Bring on the Cabaret! Bred by our own group. Large single flowers that have a beauty all of their own. The flowers seem to withstand bad weather better than their double flowered cousins and the plants being shorter are better for exposed positions. 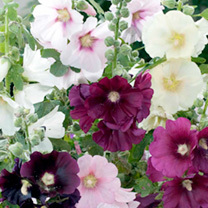 A cottage garden classic! Statuesque plants for the back of the border that flower year after year. Height 120cm (4'). HP - Hardy perennial. Full growing instructions given on packet. 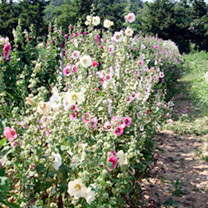 Sow April-June, flowers June-August following year; or sow direct outside May-June. Suggested planting distance 45cm (18"). Ideal for beds and borders. Suitable for cutting. Attractive to bees. Prefers full sun.